The Deeper Smart Sonar Pro+ is an amazing fish finder for all types of fishing. For shore fishers, this is something you really want to consider. Apart from fishing on the boat, you can as well fish on the shore and even do ice fishing. We are pretty sure and confident that this Fishfinder is going to put you on the spot where you can catch more fish. The Deeper Smart Sonar Pro+ is reinvented from the inside out to give you the best fishing experience. What makes this fishfinder stand out from its competitor is the fact that it lets you fish from the shore while having smart sonar. Unlike other fishfinders, the Deeper can check the water temperature, and read the depth range of the water. It comes with a casting range of 330 feet and depth range of 260 feet with a 50 times scanning capability. The fishfinder does a perfect job in showing you where to catch fish, the depth, the temperature of the water, what to throw and how to throw it. The Deep Smart Sonar Pro+ is at the top of its class when it comes to value. This portable sonar fish-finder gives you instant information about fish location, underwater structure, bottom contour, water temperature, and delivers a great burst rate for the money. For a decent sum, you’re getting a top of the line fish-finder that will always put you in the right spot where you can catch more fish. The Deeper needs to be half in and half out of water before the Wi-Fi can work efficiently. The Smart Sonar Pro+ is so small that you can even carry it in your back pocket. Housed in a waterproof casing, the deeper is super light and compact. On the outside of the deeper, you have three attachments. The middle attachment is used to cast out and drift in the boat while the bottom one is what you can cast on the shore. The top attachment is what you can attach to your boat. With the Deeper sounder mount, the device fits perfectly to any kayak. The Deeper also comes with a mini-USB port that you can use to charge it up as well as a wall charger, a USB cord, and an instruction manual. The Deeper Smart Sonar is an all-around stellar performer and works amazingly well in locating fish. Not only is the device so easy to operate, but it also does a perfect job in helping you to catch more fish. Unlike other Fishfinders that you need to attach to your boat, the biggest punch by far with the Deeper is that it allows you to use a fishing rod. And that is the more reason shore fishers are going to find it so useful. Once you mount your smartphone on the fishing rod, you can then cast the Deeper into the water. The Deeper automatically switched on the Wi-Fi mode when it is on the water and gives you the needed information to check out where the fish are. 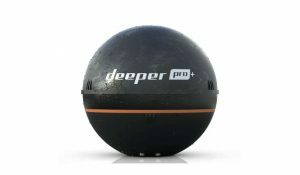 The Deeper does an excellent job of providing you with depths, structures, as well as fish targets. You can use the calendar on the app to access a fish peak time and up to date lunar. 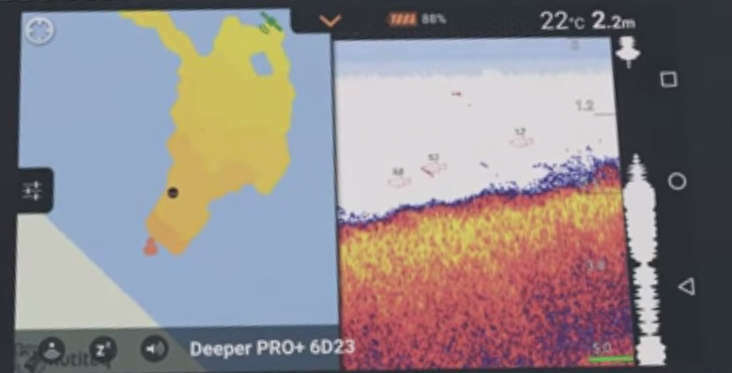 Apart from its impressive performance, the Deeper also did not forget to include some of the best fish finders features such as general settings, sonar settings, deeper pro connect, and the depth settings. The History settings take you back to where you can locate your favorite spot. On the general settings, you will find an alarm that beeps anytime it finds fish. While in the basic/detail mode, you will see the bottom composition underneath the water. The Pro+ is a wireless sonar device you can operate with your phone using the app. The app is absolutely free and packed with a lot of features such as a camera, temperature features, and maps. You have to download and install the app from the Google Play store to your phone. Once you cast the Deeper into the water, then the app will automatically connect to your phone. After that, the app starts showing you the depths, temperature and the contours of the water. At a drop-off, you will be able to locate a school of fish almost immediately at different depth range. The Wi-Fi enabled Fishfinder can send back accurate details so that you can pick up everything that is in the water. It comes with a Bluetooth to hook up and connect with your phone. The Bathymetric map is a cool feature that gives you an underwater map, showing you a clear view of what is going on in the water. The maps allow you to record information for future reference and mark your location on the map. The Deeper fish finder uses a dual beam sonar system that allows you to use the device in both open water and ice fishing. The Narrow Beam gives you more detail while the Wide Beam will cover a larger area, but offers you less accuracy, which helps to save the battery life. Unlike other fishfinders, the Deeper also features a flash reading setting that allows you to easily pick-up anything that surrounds your bait. With a 3.7 volt battery, the Deeper will take two hours to charge up when it is completely down. You can get up to 4 hours of battery life using this device at a go. Can the Deeper Smart Sonar Pro+ catch you more fish? Our answer to that question is yes! That’s why we have included this fish finder in the top 5 list. You can check the full list here. The Fishfinder will definitely put you in that spot where you can easily catch fish. The broad daylight condition is brilliant and enables you to find that weedy area where you can easily spot fish. If you want to catch a bunch of fish, then we highly recommend you give the Deeper Smart Sonar Pro+ a try. I’ve tried this one. It’s great for fishing onshore. But not so good for fishing in waters. Great review though. Thanks a lot!